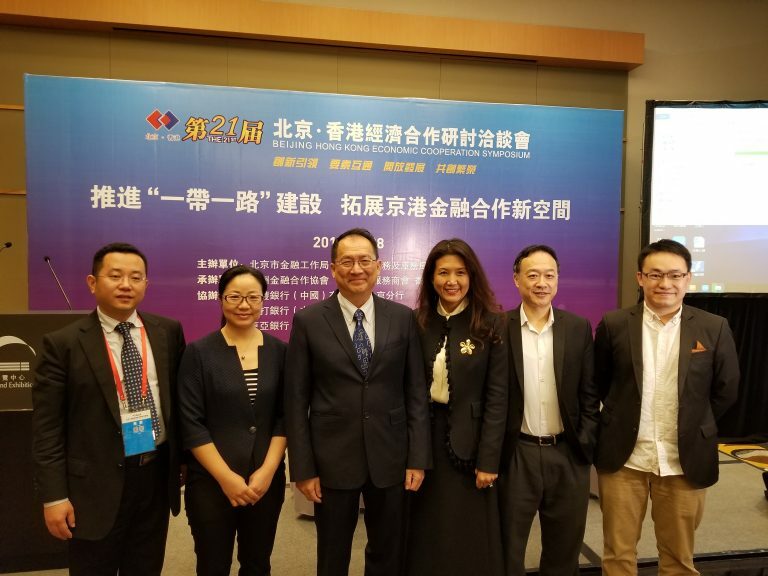 The 21st Beijing-Hong Kong Economic Collaboration Symposium was held in Hong Kong from 28-29 November 2017 with the theme of “Leading Innovation, Exchanging Resources, Driving Development, and Creating Prosperity”. 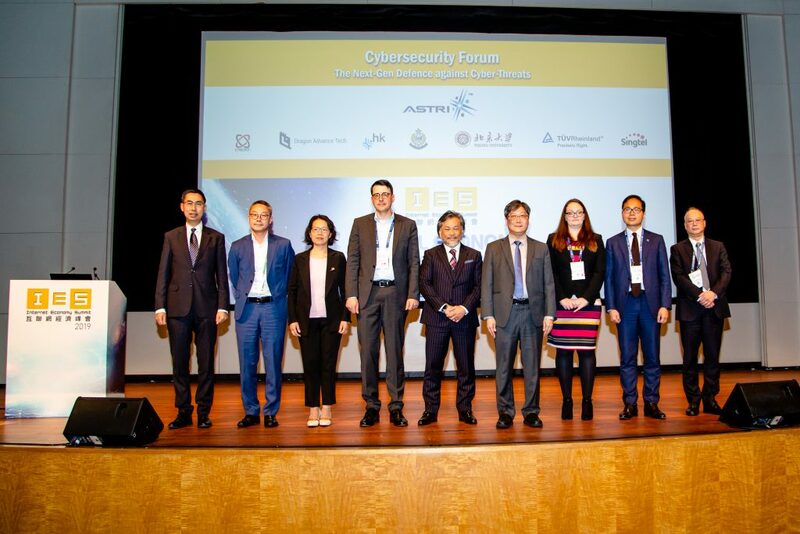 During the event, ASTRI signed a partnership agreement with the Beijing Fangshan Yancun Technology Park, to facilitate technology planning, mapping and implementation for the Financial Technologies (FinTech) cluster within the Park. 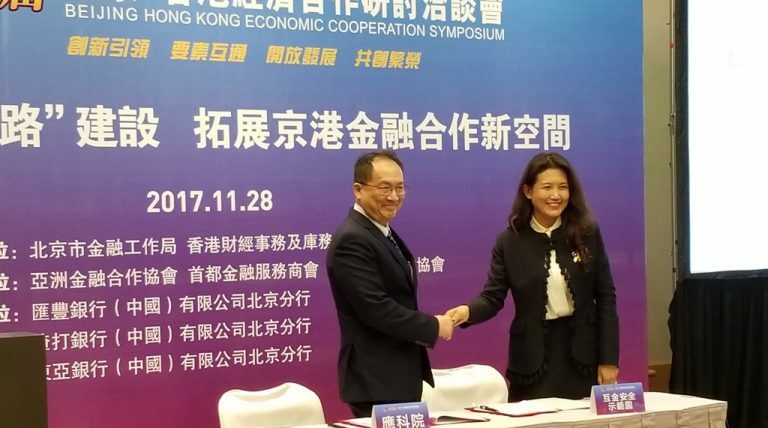 Dr Justin Chuang, ASTRI’s Vice President for Next Generation Network, and Ms Ma Xiaolan, CEO of Internet Financial Security Demonstration Industrial Park, signed the agreement on their respective organisations’ behalf. 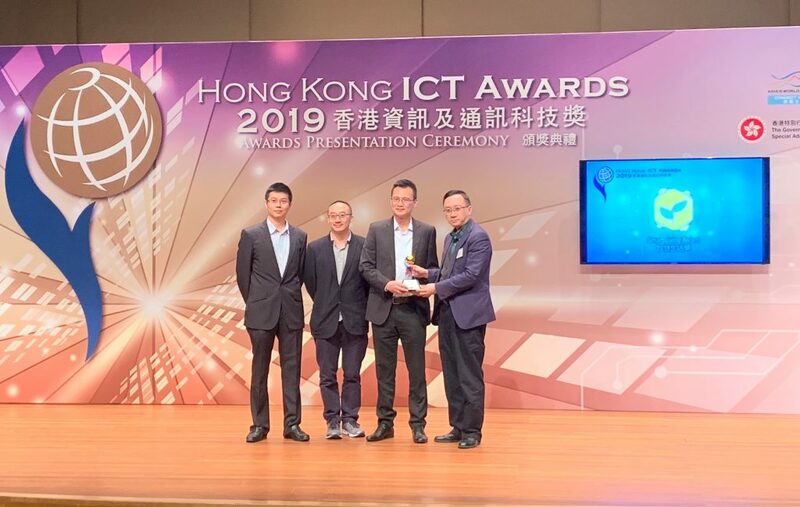 ASTRI, the largest applied R&D institution in the Hong Kong SAR, is a leading technology developer for the financial services sector in Hong Kong and this region. 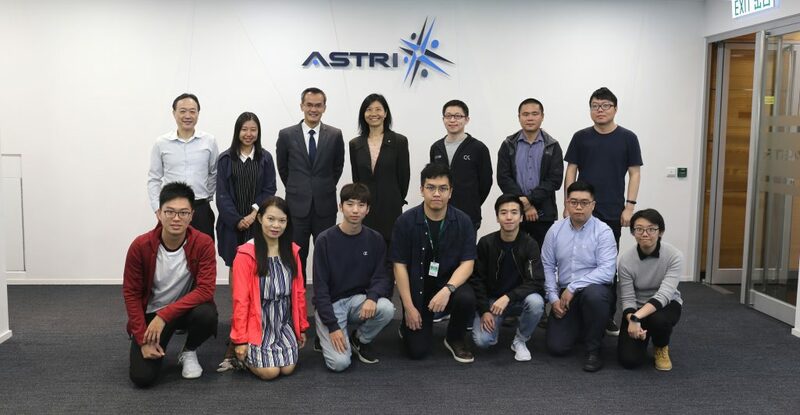 Under this partnership, ASTRI’s R&D expertise will be leveraged to develop and commercialise innovative FinTech tools and platforms in the Mainland, including Blockchain, Big Data Analytics and Artificial Intelligence. In addition to powering FinTech development in the Mainland market using ASTRI’s FinTech Intellectual Property and innovative R&D, the partnership aims to assist the development of specialised technology hubs and industrial parks specifically targeting FinTech innovation. Since Hong Kong’s reunion with the country in 1997, the collaboration between Beijing and Hong Kong has seen prolific growth in investment, trade, technological cooperation, cultural exchange and entrepreneurship. By the end of September 2017, investment from Hong Kong in Beijing had reached USD 59.13 billion, accounting for 44.9% of the capital city’s utilised foreign direct investment, according to the Beijing Investment Promotion Bureau. Over the same period, Beijing’s direct investment in the SAR reached USD 26.34 billion, accounting for 44.3% of Beijing’s foreign direct investment. Deeper collaboration in the area of innovation and technology will help Hong Kong and the Mainland to leverage each other’s strengths, and help secure strong, sustainable growth in the country’s economic development. ASTRI plays a crucial role in promoting technology and innovation not just for the city, but also for the country. 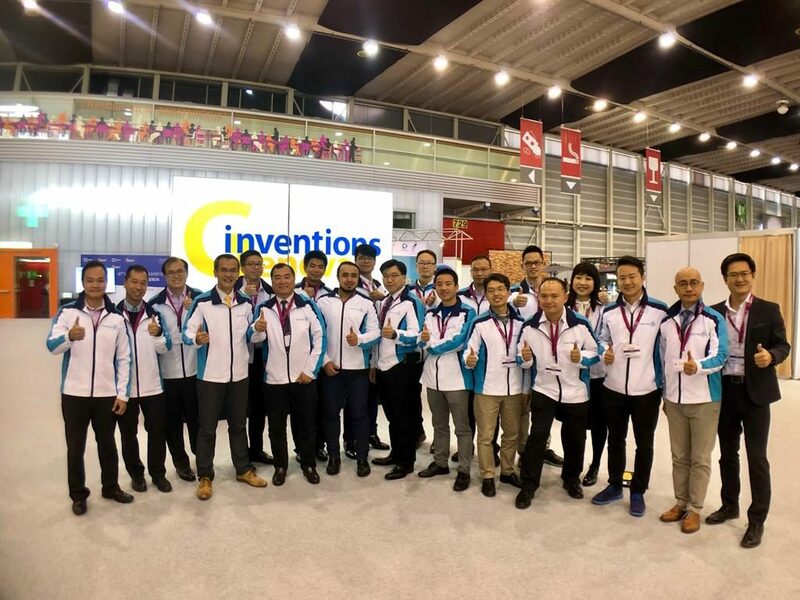 In addition to developing innovative technologies and solutions that benefit industries and communities in Hong Kong, ASTRI also contributes to the city’s innovation and technology development efforts to make the most of national and international mega-programmes like the Belt and Road Initiative, Industry 4.0 Transformation and development of the South China Greater Bay Area.